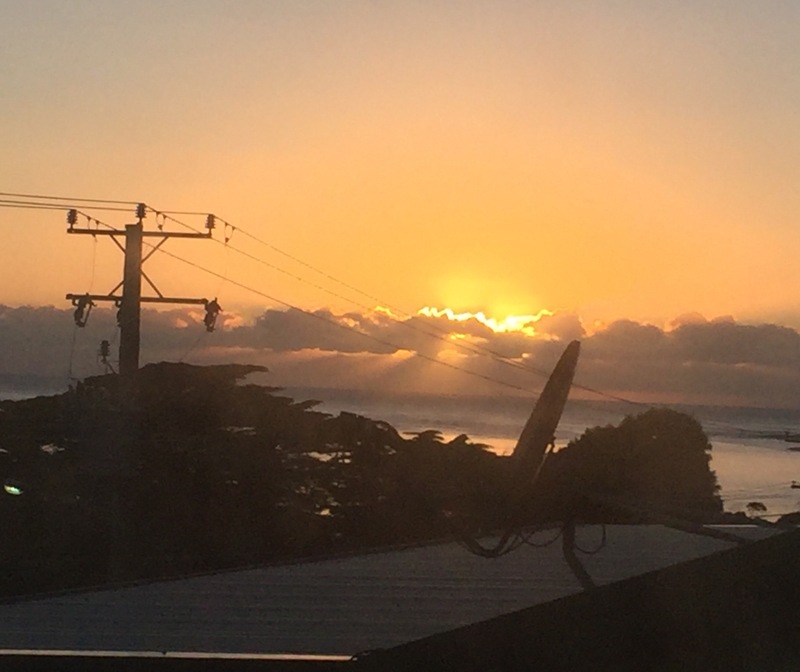 I woke up as the sun rose. It was the day of the long walk and we were leaving Bicheno, so we were up early, packed and on the road by 9.00. 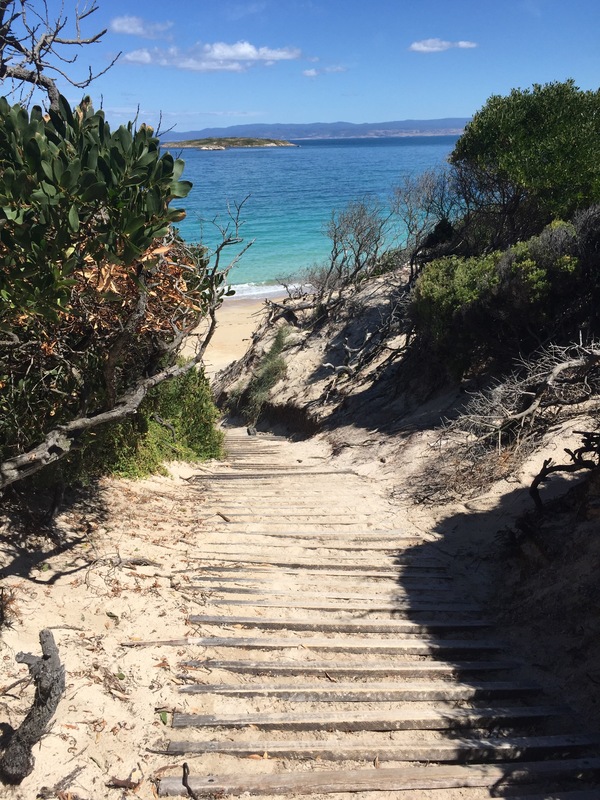 Our journey to the Freycinet National Park took about 40 minutes. 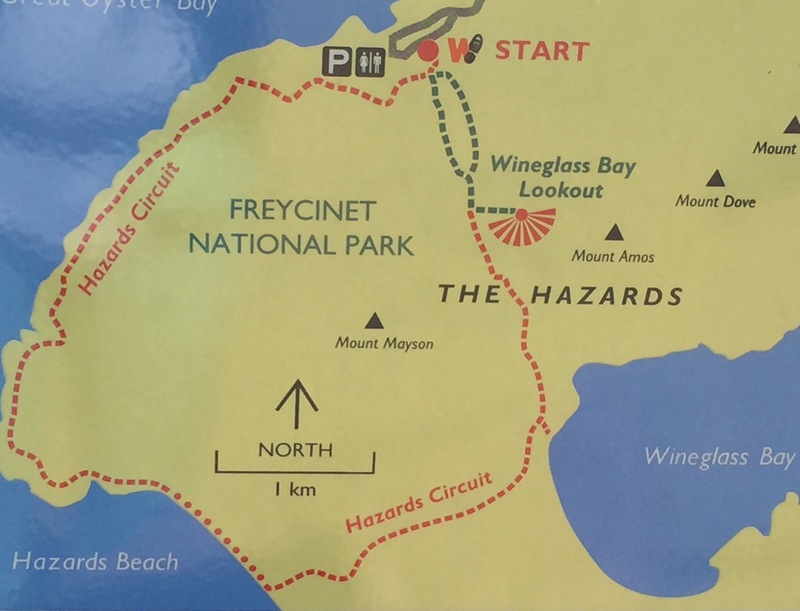 We bought our day pass and started out for the Wineglass Bay lookout by 10.00. There were a lot of people around – far more than we had expected as it is very late in the holiday season here. We were intent on walking the Hazards Circuit, not a very long walk but it was anticipated to take about 5 hours because of the terrain. Many of the people setting out were likely to take the route up to the Lookout and then back. The path meandered upward initially. People walked at various paces on a path that was a combination of steps, rocks and wooden bridges. The route twisted and turned through the trees and overhanging boulders. 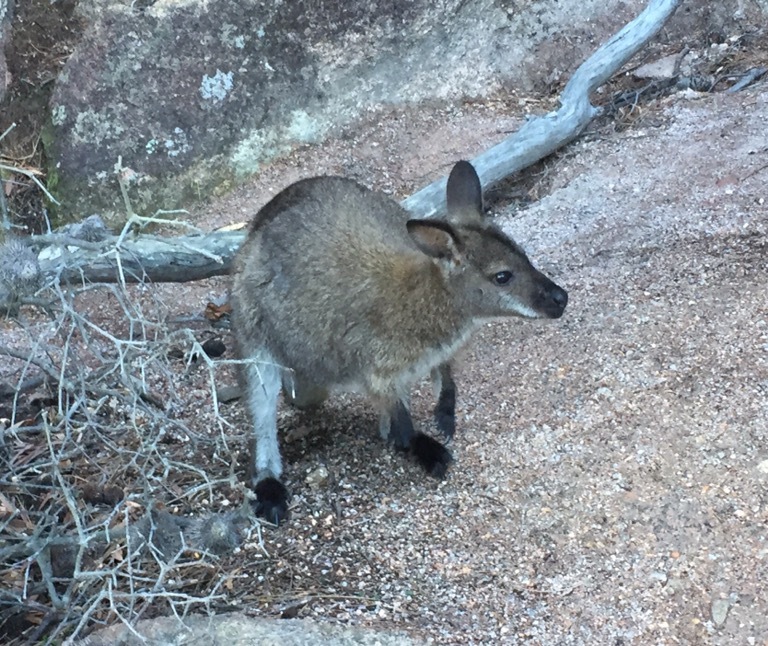 On the way we passed a wallaby snuffling around obviously unperturbed by the people passing. 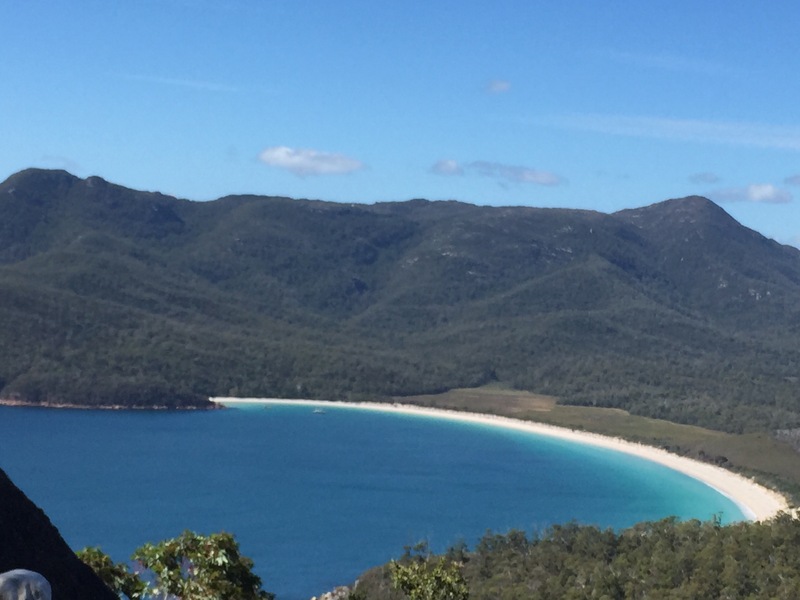 Before long the lookout point was reached and Wineglass Bay became visible below – it was the stuff old Bounty bar adverts were made of! Turning back down the path, we turned off and started on the route that took us down to the bay. It was quite steep in parts and descended and ascended through the trees. Although the path is well kept, the tree roots were quite prominent and a ‘trip hazard’ (common parlance I understand in health and safety circles!) for the unwary! For the most part the wealth of trees around were green. Eucalyptus was a prominent feature, but occasionally during the day we came across areas of shiny grey trees that looked dead. Most of the forested area showed the blackened signs of fire damage. 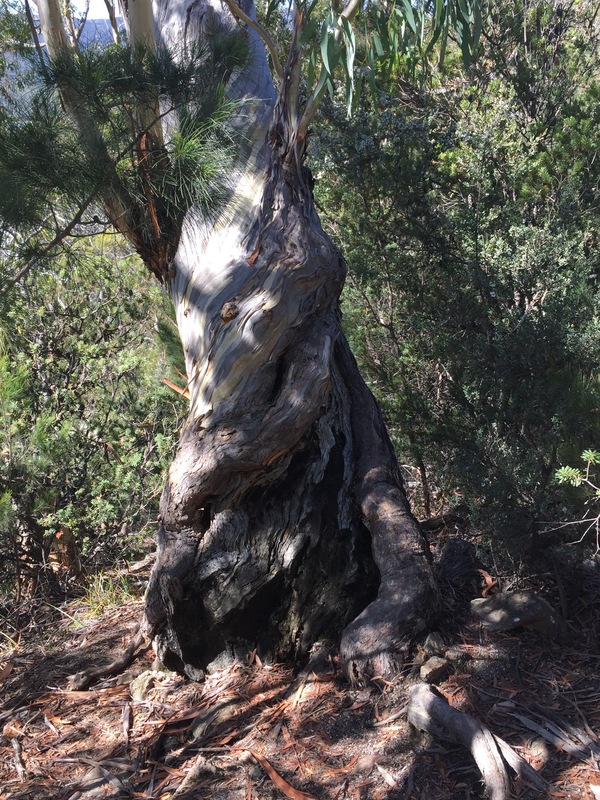 Occasionally an exceptional tree stood out and made you pause to enjoy it……..
After an hour or so’s walking we descended into Wineglass Bay. Here we found fellow walkers perched on the rocks or wandering along the sand. I could only believe the sea to be really cold as very few were taking advantage of the amazingly blue water. We had half of our lunch wraps sitting on the beach and then set out back amongst the trees to regain the path of the Hazards Circuit. We continued on our perambulation working our way through the trees. Initially we walked parallel to the bay and the blue water twinkled through the branches and then the route turned away inland. Occasionally we met people coming the other way or stopped to let others pass, but we had left the majority of people behind and for the most part our little party walked alone. We all acknowledged that it would have been good to have Peter with us to tell us more about our surroundings. However, it was a very pleasant if challenging walk. The path was very narrow so it was single file all the way. Occasionally conversations struck up, but for the most part it was watching your feet to ensure that you trod on the right stone and missed the gnarled roots determined to trip you up! Eventually we came out on a high spot where large rocks emerged through the trees and the slatted wooden path down to Hazards Bay. The path then took us along the stretch of the beach. The shells were amazing, the oyster shells particularly twinkling in the light. It was wonderful. 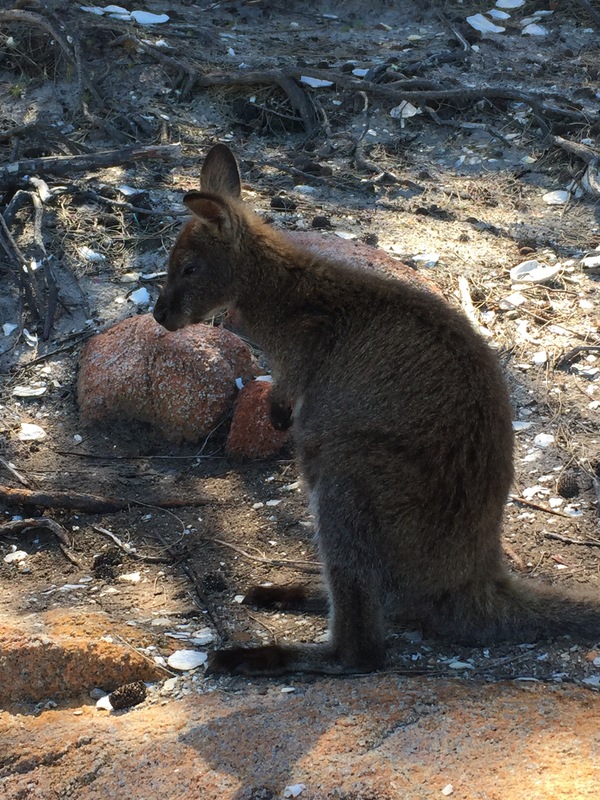 Having consumed the remainder of our lunch with the accompaniment of another passing Wallaby ……. the route took us back up through the trees to continue along the track back to the car park. Here the path was more difficult with stretches of clambouring over large ancient boulders smoothed by weather and time. It was quite tricky at times. A stick would have been useful to ‘steady the buffs’, but I had decided not to have mine with me. Everyone else in our party was more sensible!! Now and then the trees cleared and we could see the sea with the odd speedboat passing. Many of the bays are only accessible from the seaward side. After five hours walking we reached the original path back to the car park. We were all quite worn out, a bit parched and very pleased with ourselves. It had been a great walk if a bit of a work out! An ice cream and a bottle of sparkling water saw us right and we were soon off on the two hour journey to Launceston, our next port of call. Our accommodation was a little out of town but once again great views, this time over the River Tamar and Launceston.